This horse themed birthday invitation features a pretty palomino paint pony. She is standing among charming mason jars filled with beautiful flowers. There is a faux rustic wood back ground that is decorated with strings of flowers and a golden birthday bunting. It can be personalized with the birthday girl's name and all your party details. This design is also available on Thank You cards, address labels, stickers and other party supplies. 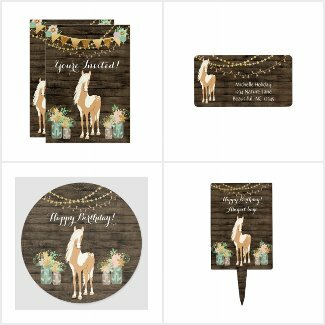 Take a look at the site Pretty Horse, Flowers Rustic Wood Birthday Set to view the entire collection.